only one person could update the site. it was difficult to create a membership area. its underlying platform was being discontinued, as was the hosting service. updated look and feel to attract new members. provide a showcase for the Society’s mission of providing access to information. provide a new members only area. allow the Society to do their own updates on an ad-hoc basis. The members of the society were generally men and over 50 in age. There is the complete range of internet expertise from never used it through to expert. Any website would take into account all levels of competence. The header font is Playfair Display. 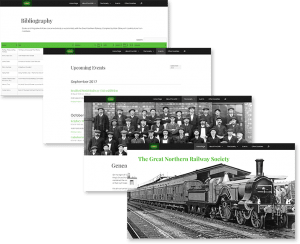 We chose this to provide a modern-historical feel to the website. This befits its mission of providing knowledge of a railway company that closed its doors in 1923. Questrial was chosen for reading ease. The nature of the website means that most of the photos that are and will be on it’s pages are in black and white. The decision was that the overriding colour palette would be shades of grey and white with a single highlight. 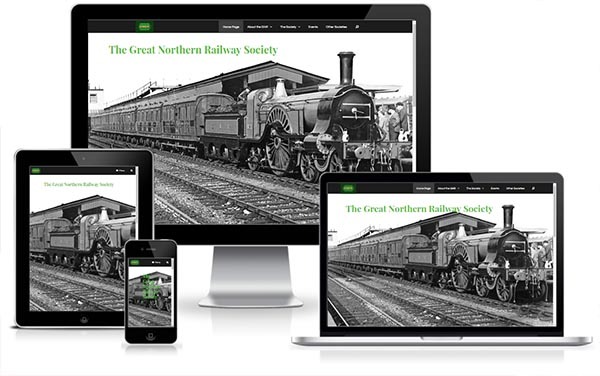 The green reflects the colour of the Great Northern Railway’s locomotives. The main difference between creating a website for member led societies and commercial businesses is the number of people that are involved. In this instance a committee of five people all had input into the specification of the design. provide the committee with access to the site at various stages during the development. if advantageous, nominate a single person on the committee to act as go between. Keeping the Society informed ensured that the development was finished quickly and the website was accepted with enthusiasm.